NOTICE: Activation key must be used on a valid Steam account, requires internet connection. 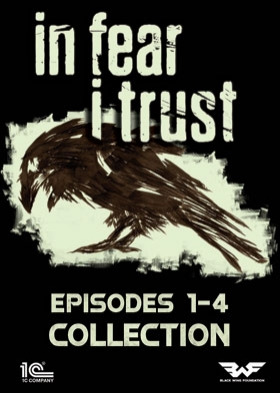 ABOUT THE GAME	In Fear I Trust: Episodes 1-4 Collection: In Fear I Trust - Episode 1: Waking Up (Audio: English / Interface: English, Français, Russia) In Fear I Trust - Episode 2: Last Desk (Audio: English / Interface: English, Français, Russia) In Fear I Trust - Episode 3: Rust and Iron (Audi… o: English / Interface: English, Français, Russia) In Fear I Trust - Episode 4: The Glimpse (Audio: English / Interface: English, Français, Russia)	“The road to hell is paved with good intentions. I wanted a better life for my family and it was only a signature away. The ‘doctors’ told me the contract was just a formality. And now, locked up in this dark reeking cell, that’s really the only thing I remember…”In Fear I Trust is a first-person psychological thriller that puts you in the role of Nikolay, now known as Patient #17, who one day wakes up in a small reeking cell. Suffering from severe memory loss and with a relentless urge to escape, your steps will lead you through an abandoned, decaying facility deep in the heart of Soviet Russia. Encountering many obstacles along the way, you’ll need to solve elaborate puzzles in order to obtain key items and documents, diaries and notes that will shed at least a faint streak of light on the dark mystery surrounding the whole ‘science’ experiment that got you here in the first place... Using your special Retrospective Vision, look beyond the fabric of the physical world to uncover glimpses of the past, revealing important hints and clues. But even with this unique ability, the road to recovering your memory and re-discovering your own identity will be long and grim…	Episode 1 - Waking Up“In fear I trust” 1st Episode tells us how the main hero Nikolay awakes with a partial amnesia in a prison cell. Then, the events take place in the doctor’s office and in the laboratory. Advancing the episode, he meets ghosts of the people who mysteriously died in those places. Thanks to the acquired retrospective vision, he is able to sense someone else’s flashbacks and to see mysterious inscriptions on the walls.The hero finds the contract of the very experiment that he signed at the beginning of the episode.Episode 2 - The Last Desk“In fear I trust” 2nd Episode tells us the story of Nikolay’s memories of horrific events that took place in the school. Nikolay finds a diary and a note from one of the students and recalls what strange things happened with the children, what experiments were carried out on them, which then influenced their aggressiveness. He finds a photo of the girl with whom he became friends and tries to remember what exactly happened to her, and why the school principal carried out all those experiments, and whether it is connected somehow with the VERSA company. Episode 3 - Iron and Rust“In fear I trust” 3rd Episode tells us about the strange events at the local factory. They took place when the player used to work there. The mysterious deaths, the mysterious inspectors. Advancing the episode, the player tries to find out what is really going on and how this is related to VERSA company. Why are people dying on a scheduled basis?Episode 4 - The Glimpse“In fear I trust” 4th Episode tells us about the events at the the local cinema. The main hero of the game visited that place in the past. This time, the story affects the main hero indirectly. The player will have to find out how the famous actresses from this theater were killed, who was involved in these events and how these events are related to the VERSA company.KEY FEATURES Critically acclaimed psychological thriller powered by the Unreal Engine Fully voice-acted narrative Use Retrospective Vision to reveal hidden clues and solve puzzles Explore eerie locations and uncover the secrets behind a classified soviet experimentSYSTEM REQUIREMENTS Minimum: OS: Windows XP / 7 / 8 / 10, 32 or 64 bit Processor: Single Core 3.3GHz or equivalent Memory: 512 MB de mémoire Graphics: DirectX 9.0c compatible with 512 MB VRAM DirectX: Version 9.0c Disk space: 4 GB available disk space Sound card: DirectX® 9.0c compatible Recommended: OS: Windows 7 / 8 / 10, 32 or 64 bit Processor: Dual Core 3.3GHz or equivalent Memory: 1 GB de mémoire Graphics: DirectX 9.0c compatible with 1024 MB VRAM DirectX: Version 9.0c Disk space: 5 GB available disk space Sound card: DirectX® 9.0c compatible © 2016 1C Company. Developed by Black Wing Foundation. All rights reserved.